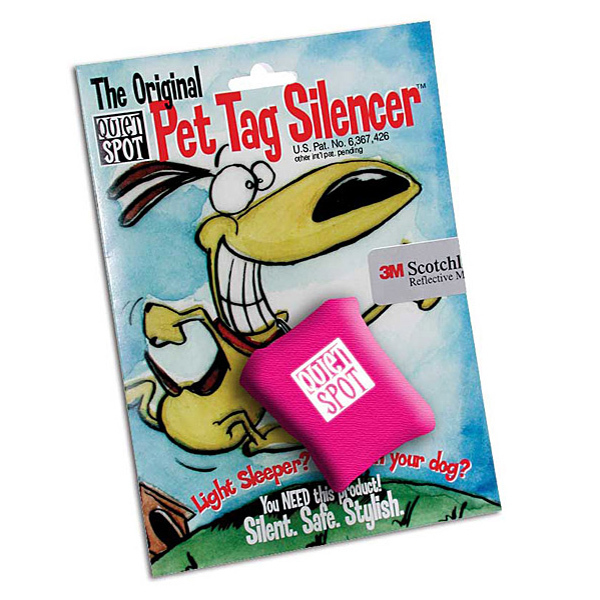 Our Quiet Spot Pet Tag Silencer in Pink offers a stylish solution to annoying tag noise. Posted On 04/08/19 by Nicole C from Rochester, NY Yes, Nicole C recommends this product! 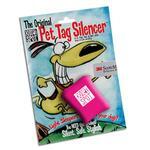 LOVE This Pet Tag Silencer!!! Posted On 12/07/18 by Nicole C from Rochester, NY Yes, Nicole C recommends this product! Can't believe I found this after all this time! Used to have one in blue for the male Pomeranian I had for 14-1/2 years.....searched for this when I welcomed my female Pomeranian to the family 2 years ago but all I could find was the ThunderCover Pet ID Tag Cover, which fell off somewhere when I was probably walking her, so I had to get new dog tags & another tag cover. Saw this in pink (matches her collar and LED harness perfectly) and it happen to be on sale plus free shipping....delivered quickly and works great! Love that the silver on the front stands out in the dark, too! Strong velcro and now she doesn't jingle! Would recommend again & again! Posted On 02/11/17 by Janet H from Sugar Land,, TX Yes, Janet H recommends this product! I have a 9 1/2lb Shih Tzu who is a people person. So I lose quite a few Quiet Spot's where she has run away. I have had them since they first came out. They are very durable, they need to be with such a shorty who always 'dips' her Quiet Spot in her meals. They wash up very well. Posted On 05/24/16 by Sonia V. from San Francisco, CA Yes, Sonia V. recommends this product! I looked every dog supply store in San Francisco and got the same answer "We don't have Quiet Spot anymore in the store and won't be ordering them." Well, thank goodness for Baxter Boo! They had a great assortment of colors (I wanted black & pink). The item was easy to order on BB and it was delivered in less than a week! Plus, as a new customer, I got a great discount! I'm very happy with my purchase and I would definitely order from BB in the future! Posted On 05/19/16 by Bibi from Manlius, NY Yes, Bibi recommends this product! The one thing I hate about dog tags is the noise when we are sleeping. This keeps all the tags in one place. It's not too big. So far there are 3 tags Rabies, ID and home again. Still can't find where I put the local dog license. I bought a second one for my new puppy but she doesn't have all her tags collected yet. Posted On 12/26/15 by Donna C from , FL Yes, Donna C recommends this product! Baxter-Boo has the cutest, best quality pet items and their Customer Service is un-beatable. The product videos are a nice touch - makes you feel like part of the family because they always hand write a note on your packing slip. I am always delighted when the product is even nicer than it looks on the video or picture. Delivery is always super fast.